Support for win 10 / 8 /8.1/ 7 / XP / Vista ( 32-bit/64-bit ) and Mac OS X 10.4 ~ 10.14: Plug-and-Play for win 10; for other type operation system, you need to install the driver with the included Set-up CD, and simple plug the our USBNOVEL wireless USB wifi adapter into your device once the drive is correctly installed. 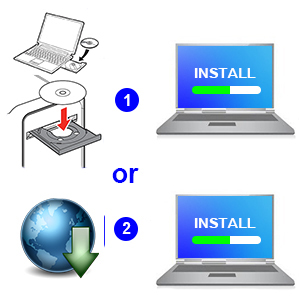 ( Download Newest driver link from http://bit.ly/2qLS37h or http://www.usbnovel.com/downloads-729c1.html or Contact us ). 18-Month Worry-free Warranty: Customer service responds to your issue within 12 hours. Enjoy the convinience that our Wireless Network Card offers. 3. 600Mbps Wifi adapter’s max speed is up to 433Mbps when you connect to 5G band,While it tops out at 150Mbps in 2.4G.Normally,your PC’s network speed can’t up to the wifi adapter’s speed as it depends on many factors,Such as your network size,router,barriers,laptop or PC ‘s internal memory. 4. Make sure your router is a dual band with 5G band if you want to get 5G WiFi signal. 5 Ghz mode stands out within short range. 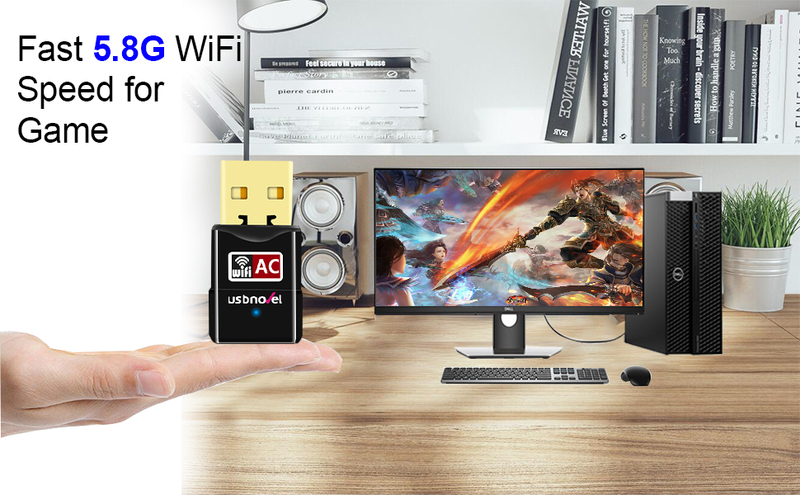 If your WiFi adapter is closed to the router, then wifi signal will be stronger under 5 GHz than 2.4 GHz .Now You want to have fast speed in watching video and playing online games, We suggest that you should connect to the 5G band. 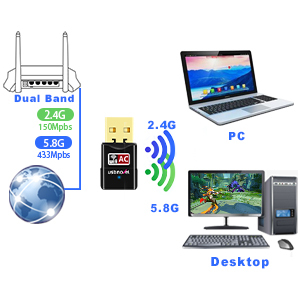 If your WiFi adapter is far away from the router, and you just want to surf the website, you’d better connect to 2.4G band for better and stable signal. 5. 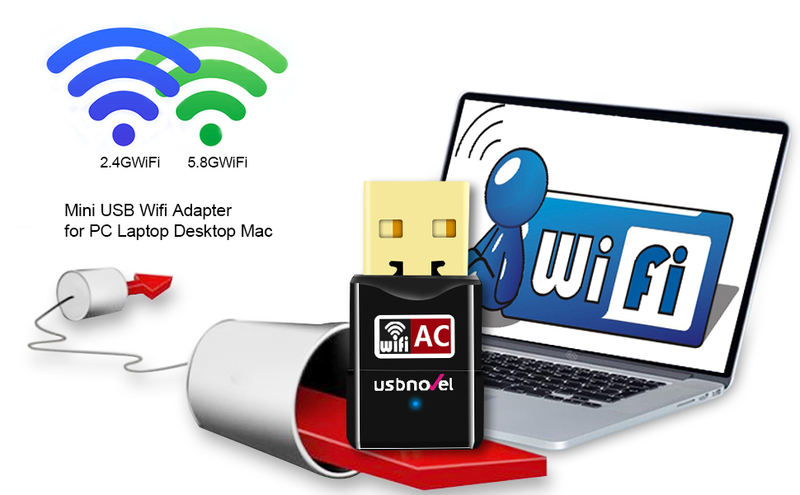 This usb wifi adapter only can receive network signals, but can not strengthen it, If you want to get booster function, then you choose a wifi extender. 6. It is different for the program between our usb wifi adapter with notebook’s built-in netword card,The ablity to receive wifi for notebook with built-in network card is no stronger than mobile phone, While external network card is not better than notebook.The same router,From the ablity to receive wifi,the speed of the phone will be faster than computer. 7. Don’t long-term shaking and pluging and unplugging,there may be looseness. When you go for a travel ,please plug it out in your bag. 8. If the wifi adapter stop working suddenly, please reinstall the newest driver from usbnovel website or update the driver manually. 9. If the connection is unstable, please check your signal strength and signal channel. 10. If you meet a problem about the driver can not be installed on Mac 10.13.3 or Mac 10.13.4 system, please follw the suggestion steps to resolve the problem. 2. Once you download the driver.Please do Right-click the driver WinRAR ZIP file,choose the “unzip to ..”to unzip it firstly.Then double-click “setup” to install the driver.If you go to click “setup” directly,it will comes up with an error message saying”Sorry!We do not support this operation system ! !” Actually.It does support your system. 4. Open the “REALTEK USB Wireless LAN Utility”, click “available networks”, select the network signal and connect. 3. No obstacles,the better performance to receive the WiFi signal More stabler–2.4G wifi signal More fastr –5.8G wifi signal The 5.8GHz 433Mbps is perfect for HD video streaming and lag-free online gaming The 2.4GHz 150Mbps Wi-Fi for normal use such as web surfing. Good wifi adapter !and easy to download the driver and esay to install the driver.Highly recommended!